I have knit Big Hug many years ago and it was never intended to be a pattern but due to the overwhelming popularity and numerous requests for Big Hug, I have decided to re-create the notes for it on this pattern page. Please note that this was knit bottom up, piece by piece and then seamed together, which is a style of knitting that I no longer choose to do. 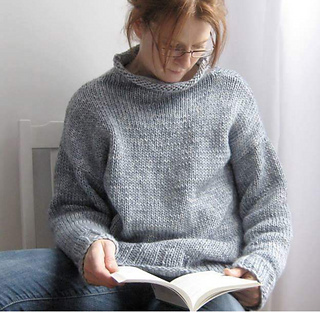 The notes are for one size: 109 cm / 43 inches in circomference at the bust; the sleeves are 45 cm / 17.75 inches in circumference at the widest part; the sweater is 69 cm / 27.25 inches long from the top of the shoulders to the bottom.